Mildred Davis and Secretary of State Paul Pate. 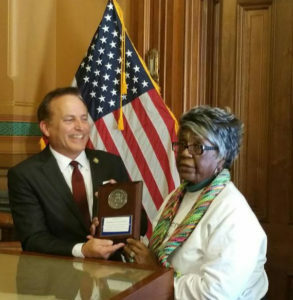 Iowa Secretary of State Paul Pate has presented the longest serving precinct election official in the state with the National Association of Secretaries of State Medallion Award for her 56 years of service. Ninety-three-year-old Mildred Davis of Sioux City has worked national, state and local elections in Woodbury County since 1960. Pate says there are five other Iowans around the state who have volunteered as poll workers since the 1960s, and another eight since the 1970s. “That’s pretty significant. These are people who have been dedicated in coming out, and working these elections. They stay there until about 6:00 in the morning, until 10:00 at night. It’s a long day,” Pate says. There are more than 1,700 precincts in Iowa, practically all require multiple workers for each election.